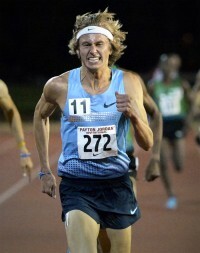 For an athlete who “wanted a medal real bad,” Thursday’s steeplechase final may have looked like an exercise in frustration for Evan Jager, who saw the race play out in similar fashion to last summer’s Olympic Final when he came in sixth. Once again, he was in the lead pack at the bell, but was out of reach of the medals at the final water jump. But Jager’s performance yesterday shows true progress from his performance in London, even if he improved “only” to fifth place here in Moscow, running 8:08.67 to miss a medal by 0.81 seconds. His upgrade in the final results came in a field with more top talent than the London final, as the Kenyan team entered four athletes, owing to the wild card entry given to defending world champions. Yesterday, not only did he narrowly miss fourth place by just five-hundredths of a second… he was less than one second from bronze, and just 2.66 seconds behind the eventual winner, all-time great Ezekial Kemboi. Compare that with finishing twice as far behind the winner (also Kemboi) in last year’s global championship, and a whole 3-plus seconds awash of third place. Most impressive: Jager ran the third-fastest performance in US history — better than Dan Lincoln’s previous American record — and he did it in a race that was on 8:17 pace two-thirds of the way through. Mr. Long-Hair-Don’t-Care dialed it down to 2:36-and-change for his final kilometer. That’s 7:48 3k pace, while jumping over stuff. Those details may be cold comfort for a runner who was clearly disappointed immediately following the race. However, there’s little question the 24-year-old is competing at a new level this season. And Jager will have the chance to face many of these competitors again — in a rabbited race — at the Zurich Diamond League on August 29th. He now owns the top three runs in American history and, at a Zurich venue well-known for being lightning fast, the right race could yield the first non-African performance under the 8:00 barrier.